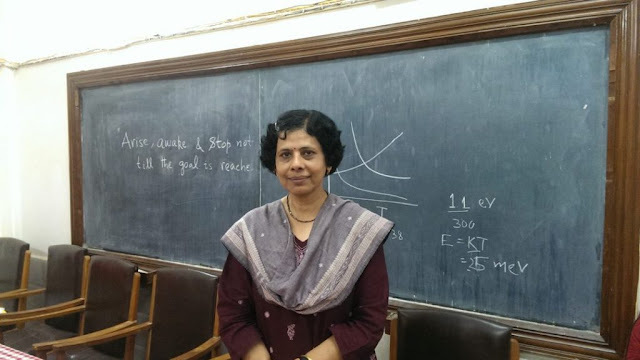 Dr Swapna Mahapatra explains the context of her research in string theory and takes us through her forty year-long journey in the male-dominated field of high energy physics. Professor, head of department, director of research and development, dean of science – “You see, I have several responsibilities at same time,” chuckled Swapna Mahapatra, a high energy physicist who joined Utkal University in 1997. Patient and calmly self-assured right from the outset, Mahapatra seemed to carry the burden and honour of leadership roles with relative ease. Of course, like any administrator in a State university, her schedules are generally chockablock with classes and meetings. Yet, Mahapatra promised me half an hour of her time and stood by her word. Without rushing through questions, she explained the context of her research in string theory and took me through her forty year-long journey in the male-dominated field of high energy physics. It was only an hour later, when she was alerted that a contingent of scientists had arrived for her next meeting, did she excuse herself. The 70s and 80s were spine-tingling times for high energy physicists around the world. Aided by technological advances such as particle accelerators, they were making great progress in understanding what primary particles make up the entire universe and what kinds of interactions can exist between them. Four fundamental interactions/forces exist – electromagnetic, weak, strong and gravitational – and the big question was whether the theories for each could all be ‘unified’ into a single theory that can explain the working of our universe. In 1983, CERN discovered the W- and Z-boson – the particles which are responsible for the ‘weak force’. This was a big step forward in the goal for unification. The excitement was infectious and it did not spare 23-year-old Mahapatra, who was just commencing her PhD at Department of Atomic Energy research establishment Institute of Physics (IOP). “I had heard couple of talks on unification of fundamental interactions during my MSc and also during my PhD coursework and it fascinated me. That’s why I decided to work in high energy physics.” The reason these discoveries come under the umbrella of “high energy” physics is because larger and larger amounts of energy are required to zoom in to particles that are tinier and tinier (yet have high mass), she explained. A GUT (that merges the first three forces) is not yet a reality. However, merging strong interactions is still considered a more attainable goal than merging gravity, the fourth force. Gravity is still relatively mysterious and so it seems like an alternative model is required to unify all four into a theory of everything (TOE). To Mahapatra, string theory seems like a good bet to get there. Driven by the fast moving nature of the field, Mahapatra spends a lot of time making sure she is up to date. “If you ask me if whether there are any experimental signatures of string theory, I’d say there isn’t any direct evidence, but there is lots of indirect evidence.” She pointed out the example of the supersymmetry theory which predicts that every particle will have a supersymmetric partner particle (with a spin that differs by half of a unit, for example bosons and fermions) that can explain a lot of gaps in the reigning Standard Model. Supersymmetric particles are also a key ingredient in string theory. The pieces of the puzzle as starting to fit. It’s no wonder that after all these years, high energy physics continues to hold her fancy. “Various branches of physics come together – gravitation, cosmology, hydrodynamics, string theory, supergravity, supersymmetry, even condensed matter physics – everything is now interrelated! Born in the city of Cuttack in Odisha, Mahapatra was brought up in a very academically-inclined family. One of her aunts was a mathematician in Berhampur University, another was a psychiatrist, and her father was a professor of Odia literature. “My mother was also a student of science, very interested in chemistry. But she was too shy to protest getting married. She became a housewife. It was her dream that I should do well in education. They gave me full freedom to study whatever I wanted,” she said. For her PhD, Mahapatra finally made the big move out of home to IOP in Bhubaneswar. Towards the end of her PhD, she got married to fellow physicist Karmadeva Maharana, who was a faculty member at Utkal University till he retired in 2011. Postdocs in Mumbai and Chennai followed. Mahapatra is proud about the tradition of good research that her department has cultivated. “We got accredited A+ this time by NAAC. Very few state universities manage this. We worked very hard for this,” she said. She is also pleasantly surprised with the amount of applications her department receives every year. “We are receiving about 1,300 applications for 30 seats. Most are from Odisha or West Bengal”. This piece was originally published by The Life of Science.